With maple syrup and almond milk, this simple breakfast recipe is full of fall flavors thanks to fresh pears, pecans, and pumpkin. Sliced or dice pears, as preferred (peel, if desired). Set aside. Bring water, oats and canned pumpkin pie mix to a boil, stirring intermittently, then reduce heat to medium and continue cooking for approximately 3 additional minutes, until oats are done to taste. 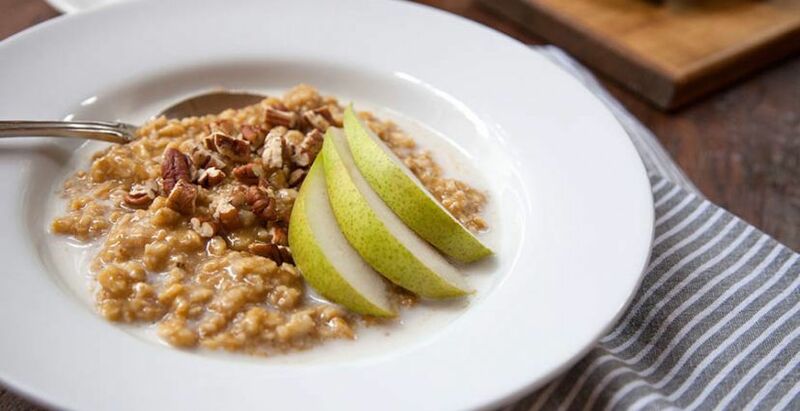 To serve, top pumpkin oatmeal with fresh pear, a sprinkle of chopped pecans and ground cinnamon, and a drizzle of almond milk and maple syrup. * canned pumpkin pie mix is pureed pumpkin that has been sweetened and flavored. Per Serving: Calories 365.8 (22.9% from fat); Fat 9.3g (sat 0.4g, poly 1.3g, mono 1.8g); Protein 7.3g; Carbohydrates 68.6g; Fiber 12.5g; Sugar 23.3g; Cholesterol 68.6mg; Potassium 84.7mg; Sodium 175.2mg.